The first U.S. Census in 1790 reported a total population of around 3.9 million in the new nation. Nearly the entire enumerated population was composed of either immigrants or their descendants (most Native Americans were not counted). Combining from different sources, a rough estimate of the total number of immigrants from Europe and Africa during the colonial era (between 1500 and 1790) totals about 950,000. As with most large-scale conflict, population shifts accompanied the upheavals of the American Revolution. By the end of the war, around 50,000 British loyalists had migrated to Canada, while 12,000 others had moved to other British colonies. The war brought tens of thousands of temporary migrants in the form of foreign-born soldiers. British troops were aided by around 30,000 German Hessian mercenaries. 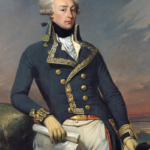 On the American side, several thousand French troops aided the Continental Army at Newport, Rhode Island and Savannah, Georgia, and several prominent foreign-born officers served under George Washington, including the Germans Baron Von Steuben and Baron Johann de Kalb, the Polish-born Casimir Pulaski and Tadeusz Kosciuszko, and the French Marquis de Lafayette.